Very late to the party here and thought I wouldn't be able to come up with a photo at all. But, on searching through the archives, I came across the following. Taken on a visit to Gent, in Belgium, a couple of years ago, it's a record of a very interesting lunch. And also, a salutary lesson. Lesson: Don't be a smartass. I like languages and flatter myself that when visiting a country where the first language is not English, I will, at least, 'have a go.' I have some schoolgirl French and a bit of Italian, so when I had mastered enough Dutch to say Hi and Goodbye and order a coffee, I thought I could manage a lunch menu without help. 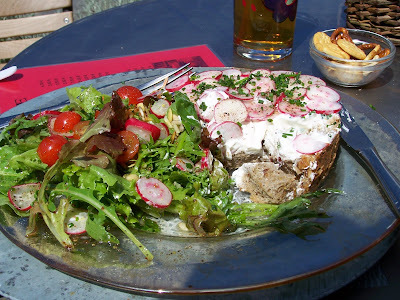 Which is how I ended up with a plate of radishes atop a pile of soggy bread covered in curdled milk. (There are more radishes hiding under the salad leaves.) My husband was grinning and making mmmm noises into his fish soup. I was trying to work out how many more radishes I could conceal under the cutlery. In 5 weeks and 2 days we'll be embarking on a trip to the US. I'm resolved that I will make no assumption regarding what's on the menu and will ask if I'm not sure. And I'm rather hoping there won't be too many radishes! Don't worry, I think you'll be understood here if you ask! Where are you visiting? We're starting off In LA & heading south to San Diego, then across SoCal, southern Arizona via Tucson, southern New Mexico via El Paso, Texas via Fort Worth, then across Louisiana, Mississippi, Alabama via Montgomery to Savannah GA via Macon. Phew! Will do a post about the route soon as we'd welcome hints and tips for the journey. so how were those radishes! Hmmm... You may want to take a Berlitz course after all; Louisiana, Mississippi, and Alabama are ostensibly English-speaking, but it's an English which is unlike that spoken elsewhere in the English-speaking world. Luckily I have friends who live down there who act as translators whenever I visit. The picture of the salad doesn't look all that bad, although I'm assuming the white stuff is what you called "curdled milk." Is it yoghurt, or cottage cheese, maybe? kimy - we're unlikely to hit Texas until the 1st week of May, but will certainly email you when we have a clearer idea of our itinerary.